Hello all. It's been forever since I've stopped by this place, but it's good to be back. 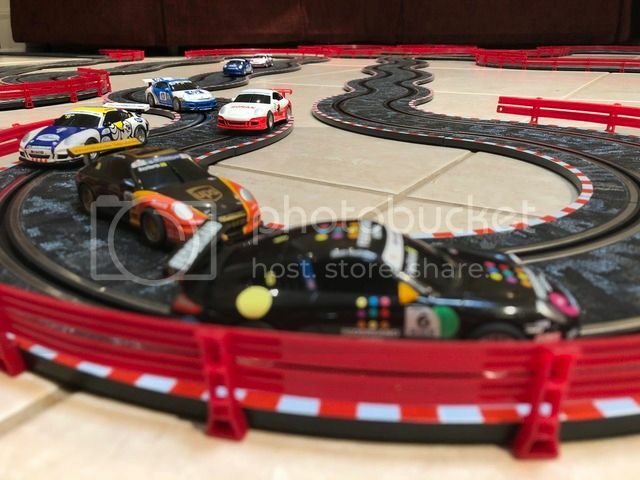 I broke out the slot cars over the holiday break for my 3 kids & we're still having a blast. I've got all SCX Compact sets, plus tons of extras, and when we clean it all up...which I'm trying to delay...I'd like a better way to store the cars. My raceways, cars, controllers, and collector pieces unfortunately have to live in a basement. Over my 50+ years in the hobby, I've always kept all cars and controllers in "zip lock" type bags, and it's a good idea to be sure all your slot car accessories are properly protected during storage. I've had 1/24 scale commercial track cars stored for years like this, and besides a good "massaging" of the rear tires (never put them away dirty) and a quick lube they're ready to go. Take it easy with the power up of the motors, don't run them wide open immediately, slowly bring them up to speed. Lots of great stuff there! Nice and neat! I like those - which storage units are those in your picture, can you provide a direct link to it from the manufacturers website? The Red Bins closest to the window... are those where you store your cars?